Angeles’ Changing Table with Locking Stairs has a single piece molded top that is easy to clean and maintain. There are no sharp corners or crevices to harbor dirt and bacteria. The 7"D changing well allows for 1" thick mat and still meets the 6"D requirement. 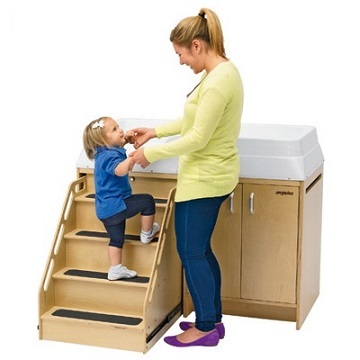 Features roll-out stairs that safely lock into place. Eliminates lifting growing toddlers and makes changing fun. Sturdy wood storage shelf keeps changing supplies organized within reach.